It’s National Tile Day, and we’re celebrating in true #WhyTileStyle by highlighting some of 2019’s most anticipated tile trends. The always classic wood look — wood-look ceramic tile has the allure of hardwood, plus all the superior advantages of ceramic tile. 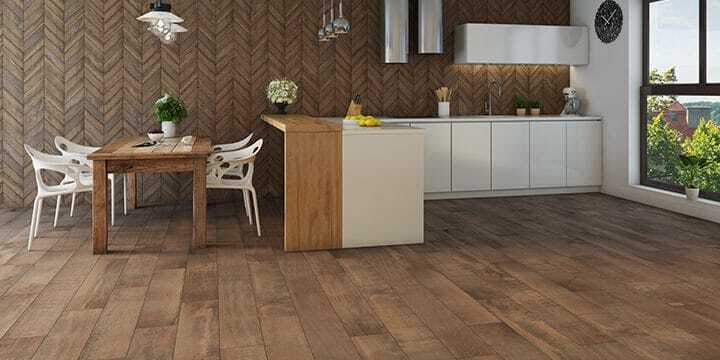 We’re seeing swoon-worthy scenes of wood-look tile captivating social media, especially Instagram, as the world falls in love with this beautiful and functional tile design. Here are just a few enchanting looks that have captured your attention. If you didn’t know that you can put tile outside, you do now. Ceramic tile is water-resistant, and many options can withstand freeze and thaw cycles that can damage other flooring materials. Plus, tile’s fire-hardened surface won’t fade or warp from the sun. These qualities make ceramic tile a beautiful and durable option for outdoor use in any climate. We love the wood-look tile on this luxurious patio. This design combines a pattern traditionally seen with hardwood and a slightly washed out timber color to create a patio that always looks Instagram-perfect. No need for staining or weather-proofing — the long-lasting beauty of ceramic tile is baked right in. The “Instaglam” of this floor design is thanks to a creative designer and expert craftsmanship. First, we have the popular herringbone pattern, where two tile panels are brought together to form a V.
Because this floor is ceramic tile, there’s no need to worry over splashes from the sink or tub. Ceramic tile is water-resistant and includes options that are slip-resistant. Ceramic tile can easily be cleaned with water alone, making bathroom maintenance easy and quick. Ceramic tile isn’t just for floors. This feature wall makes a unique statement with wood-look tiles in variegated “greige” shades and a ledger panel design. Stunning installations such as this showcase that beautiful tile is art, and all you need for a decor that reflects your individual style. What’s great about tile for bedrooms? Ceramic tile is inhospitable to mold, mildew, and bacteria and tile’s fire-hardened surface won’t harbor dust mites. Unlike other flooring options, ceramic tile is made of naturally occurring materials. You can rest assured on tile’s healthy surface knowing that allergy irritants won’t get in the way of your good night’s sleep. Ceramic tile offers incredible design flexibility, with a vast amount of wood-look tile designs, shapes, colors, and installation patterns to fulfill exactly what you are looking for (or dreaming of). For more inspiration, visit our Design Gallery to explore over a hundred unique ceramic tile wood looks and even more ideas collected on our wood-look Pinterest board. Our trends topic will continue as we showcase an exciting ceramic tile trend each week leading up to Coverings 2019, the preeminent event for the ceramic tile and natural stone industry in North America, taking place April 9-12, 2019 in Orlando, Florida!